A hemangioma (he-man-jee-O-muh) is a birthmark that most commonly appears as a rubbery, bright red nodule of extra blood vessels in the skin. Sometimes called a strawberry mark, a hemangioma grows during the first year of life, and then recedes over time. A child who had a hemangioma during infancy usually has little visible trace of the growth by age 10. A hemangioma can occur anywhere on the body, but most commonly appears on the face, scalp, chest or back. Treatment of a hemangioma usually isn't needed, unless the nodule interferes with vision or breathing. A hemangioma may be present at birth, but more often appears during the first several months of life. It starts out as a flat red mark anywhere on the body, most often on the face, scalp, chest or back. Usually a child has only one mark, but some children may have more than one, particularly if they're part of a multiple birth. During your child's first year, the red mark grows rapidly and becomes a spongy mass that protrudes from the skin. The hemangioma then enters a rest phase and, eventually, it begins to slowly disappear. Half of all hemangiomas resolve by age 5, and nearly all hemangiomas are resolved by age 10. Although the color of the birthmark also fades, faint — but permanent — discoloration of the skin or residual extra skin may remain. 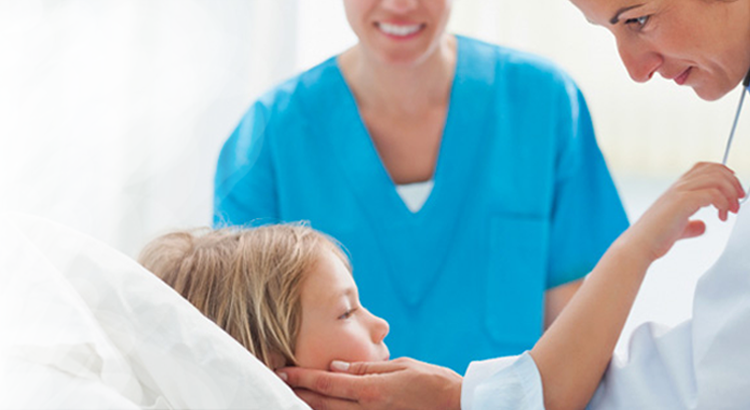 Your child's doctor will monitor the hemangioma during routine checkups. Contact your child's doctor if the hemangioma bleeds, forms a sore or appears infected. A hemangioma consists of an abnormally dense group of extra blood vessels. It's not clear what causes the blood vessels to group together, although there may be a hereditary component involved. Occasionally, a hemangioma can break down and develop a sore. This can lead to pain, bleeding, scarring or infection. Depending on where the hemangioma is situated, it may interfere with your child's vision, breathing, hearing or elimination, but this is rare. A hemangioma is diagnosed based on appearance. Diagnostic tests aren't usually needed. The majority of hemangiomas never need any form of treatment. Some parents feel that hemangioma treatment is necessary because the marks can be disfiguring and may cause social or psychological problems. Doctors, however, may be hesitant to treat a hemangioma that isn't causing physical problems because hemangiomas usually fade gradually without treatment, and because treatments have potential side effects. Corticosteroid medications. Corticosteroids can be injected into the nodule, given by mouth or applied to the skin. Side effects can include poor growth, high blood sugar, high blood pressure and cataracts. Laser surgery. Lasers can stop the growth of a hemangioma. Sometimes lasers can be used to remove a hemangioma or treat sores on a hemangioma that won't heal. Side effects include pain, infection, bleeding, scarring and changes in skin color. Research to find other treatments with fewer side effects is ongoing. Some newer, though still experimental, treatments include beta blockers, interferon alfa and topical immune suppressants. If you're considering treatment for your child's hemangioma, weigh the pros and cons with your child's doctor. Remember, most infantile hemangiomas disappear on their own during childhood.